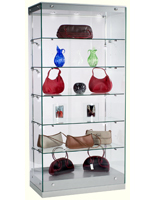 Display Cabinets, also known as Full Vision Showcases, are This Company's Specialty! The EuroVu Simplice Line of Towers is Engineered and Built in Europe! The full vision showcases have wheels for mobility. Frameless, tempered glass construction is elegant. Full vision showcases lock for security. Cherry color laminate coordinates with retail environments. 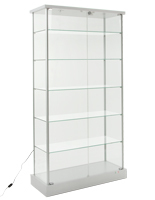 Display Cabinets that have (4) Shelves - Ships Unassembled for Lower Freight Cost! These retail store fixtures, display cabinets that lock feature European engineering and craftsmanship! 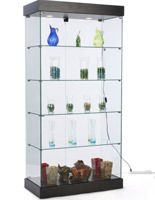 This glass display tower belongs to the EuroVū Simplice line of store fixtures. 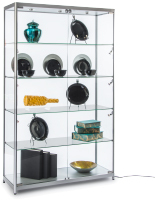 What traits define EuroVū Simplice display cabinets? Simplicity, quality, elegance and affordability are all incorporated into this series of store furniture. These display cabinets are both simple to assemble, and simple to use. Please reference the video below for guidance on assembly. 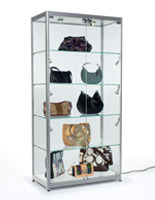 The user-friendly features of these glass display cabinets include locking doors and mobility. Both doors swing open, which provides easier access to contents stored within than sliding doors do. Additionally, a single lock at the top of these display cabinets that have a cherry-color base allows workers to leave the cabinet unattended, yet secure. Four wheels make these display cases easy to move anywhere on a showroom floor. The casters do not lock, as the base fully covers the wheels. 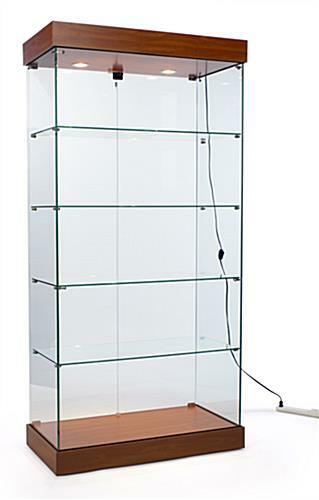 These display cabinets have tempered glass shelves, doors and walls. Why is it important that retail store furniture be made with tempered glass components? The reason is tempered glass is far more durable and safer than untreated glass. Another feature that makes these display cabinets unique is a frameless design. Small brackets connect the glass walls together. Additionally, the shelves rest on small shelf pins that are barely noticeable. The frameless construction allows potential customers an almost completely unobstructed vision of merchandise stored on each shelf. Both the base and canopy of this retail showcase have an MDF [medium density fiberboard] construction. The cherry-color laminate has a subtle wood grain design that emulates the look of a solid wood construction. 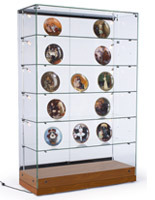 However, these European display cases are much more affordable than those made from solid wood.